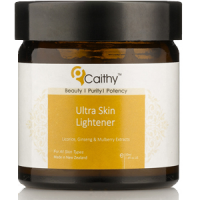 This is a review of Caithy Ultra Skin Lightener. Caithy states that this effective skin whitening cream is efficient and safe for regular use. They argue that the product contains a well-researched formula designed to cleanse, exfoliate, and moisturize the skin. We have analyzed factors about this product to determine if it can work as intended. In doing so, we will help you make a wise consumer purchase. 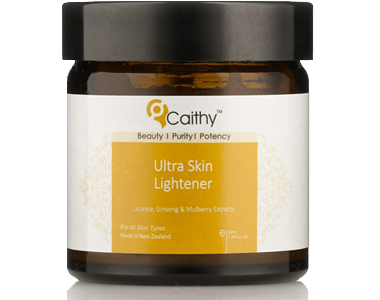 What’s in Caithy Ultra Skin Lightener? This product contains a long list of ingredients, however, the manufacturer has refused to admit which are active and inactive. As a result, we cannot accurately assess which ingredients are working towards the benefit of this product. The ingredients outlined above are common to many skin care products because of their benefits. Aloe Vera Leaf Juice is a soothing agent that heals the skin. In doing so, it can reduce pigmentation and signs of aging. Glycerin is a moisturizing agent that regulates oil balances. Shea Butter is another moisturizing ingredient that smoothens the skin. Cocoa Seed Butter is rich in fatty acids that restore the integrity of the skin. Mulberry Root Extract prevents the formation of wrinkles and is known to brighten skin tone. Lactic Acid is an exfoliating agent that can encourage the growth of healthy, new cells. While these ingredients have positive properties, they cannot be a complete source of skin lightening. This is because they are often not as powerful as patented ingredients. Several competitor products contain patented ingredients to ensure that their formulas deliver optimal results. Another concerning factor is that there is no clear indication of a cGMP certification which would, otherwise, showcase quality manufacturing processes. How Do You Use Caithy Ultra Skin Lightener? Users are advised to apply the product liberally to dark spots, acne scars, discoloration, sunburn spots, freckles, and hyperpigmentation. This should be done twice daily for a minimum of ten weeks or until you notice a difference. This lengthy period before results is concerning as long-term use may not be an affordable option. Furthermore, the manufacturer fails to provide the ingredient concentrations. This makes it difficult to determine the strength of the formula. If you are wanting to purchase this product then you can do so through the manufacturer’s online store. A 50ml tub can be bought for $45. This is significantly more pricey than many alternatives on the market. This, coupled with the fact that it does not contain any patented ingredients, is a major concern. The omission of bulk-buy deals or discounts means that long-term use could become a costly venture. In order to discover whether this product is supported by a guarantee, we had to do extensive research. This does not bode well for the reliability of said guarantee. Furthermore, we found that the guarantee only applies within 15 days from purchase. This does not give users enough time to truly test the product efficacy. This short guarantee showcases a lack of confidence in the product’s ability to deliver on manufacturer claims. We were unable to find substantial customer reviews for this product. This makes it extremely difficult to vouch for its effectiveness. This may seem like a wise product choice. It contains a number of safe ingredients that are known to lighten the skin. It is also supported by a manufacturer guarantee. That said, the guarantee only applies for 15 days and this is not nearly enough time to test product efficacy. The limited customer reviews mean that we cannot be sure it will work. The lack of patented ingredients brings the formula into question. And, the steep price is not sustainable. Therefore, we recommend purchasing a more proven product.